A pair of colour printed stipple engraving by Jacques Barraband published in Paris between 1801 and 1805. These plates appeared in a monograph by the French natural historian, Francois Levaillant, entitled Histoire Naturelle des Perroquets. 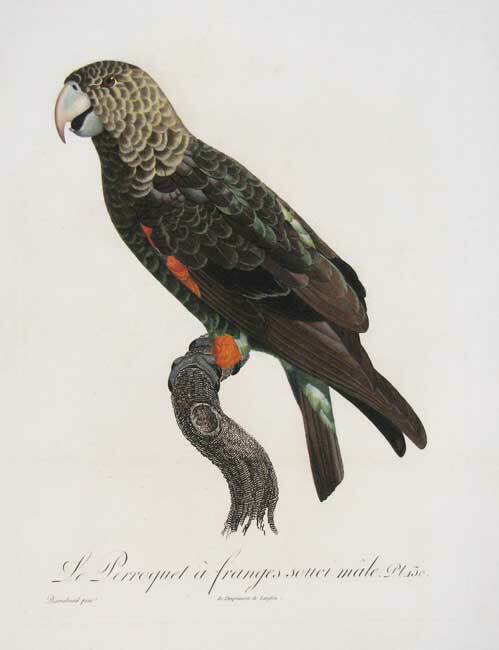 Levaillant, who was both an explorer and a natural historian, set out to compile the definitive study of parrots and parakeets. To illustrate his writing he employed the talents of his great friend and much-acclaimed artist, the court painter, Jacques Barraband. 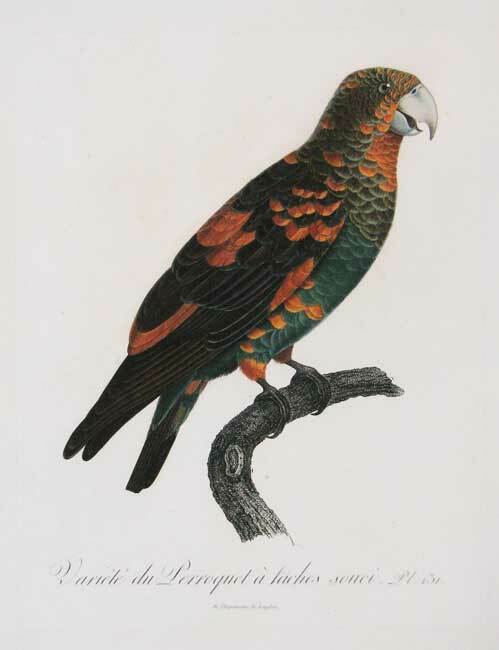 Between them they created the Histoire, which was to become the most sumptuous and detailed study of parrots ever made. At a time when many new species of birds were being discovered and the New World was opening up outside Europe, it is hardly surprising that these illustrations captured the public imagination to the extent that they did. The plates themselves were partially printed in colour and then the details were finished by hand. No other artist has so successfully captured the fragility and finesse of the parrot's plumage. This is all the more surprising when they are placed in context at a time when the widespread use of lithography was still in its infancy and the French dominated the field of ornithological art. It was the Emperor Napoleon himself who encouraged the publication as part of his personal determination to produce a series of lavish publications that would rival those undertaken by Louis XIV and promote the glories of Napoleonic France amongst the crowned heads and learned institutions of Europe.